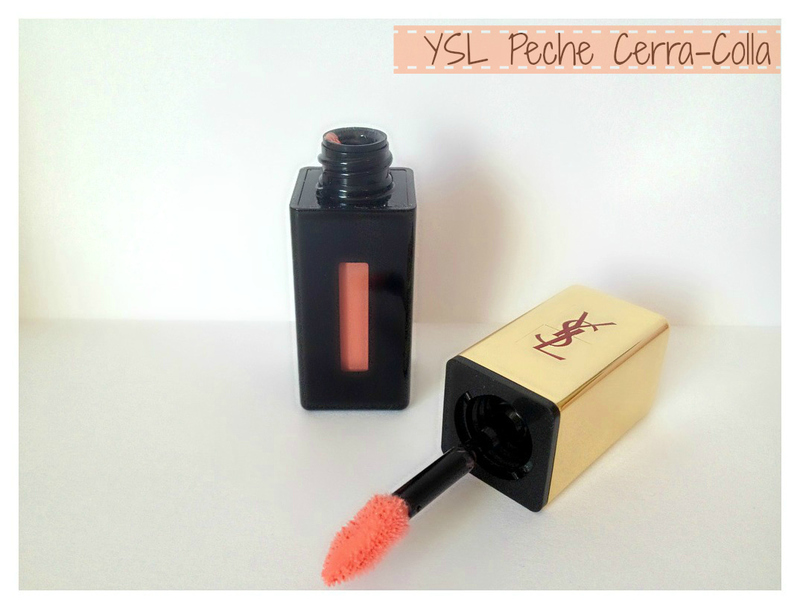 Today I'm going to be reviewing my gorgeous new YSL Glossy Stain in Peche Cerra Colla which may I add was a total impulse buy haha. I walked past it whilst shopping and for the rest of the day I thought why didn't I just stop and check that out?! - So true beauty blogger style I got home done my research and the next thing I know it arrived at my front door (oops). I already own two other Glossy Stains, so I knew that I was going to be in love with the formula and also the beautiful Peach/Coral shade. If you haven't tried a YSL glossy stain the perfect way to describe them is being somewhere completely in the middle of a gloss, stain and lipstick. I hope you enjoy this review lovelies and I would love to hear from you in the comments section below. Glossy Stain from Yves Saint Laurent provides ultimate wear, ultimate shine and ultimate Colour The true revolution of this decade is the coming together of an extremely long-lasting stain formula and glossy shine, using a patented exclusive spatula for precise and smooth application. Pure water-soluble pigments fused in a transparent texture for non-sticky, long-lasting, high shine gloss. I'm a huge fan of the YSL glossy stains and everything about them is really unique. Firstly, the texture is really unusual and doesn't feel like any other in my opinion. Then there is the patented doe-foot applicator and this is by far the nicest applicator I have ever used. Peche Cerra Colla is a beautiful light Peach shade and it really is as beautiful as it looks in the packaging. This shade just screams spring/summer and holiday to me as I can imagine it looking beautiful with a tan, but don't get me wrong I also love it on my natural B20/30 Skin tone. I find that I need around 2/3 swipes to get a good coating on my lips, but I find that's all I need as its really long lasting. Even when the gloss does wear off you still have the stain left on your lips, which is nice as then it still looks like you have a Colour on your lips. I also believe that even though this shade is relativity new that it has now been made a permanent shade * Yay*. In terms of the formula/packaging I can't find a single fault, but I did find something to mention about the shade. 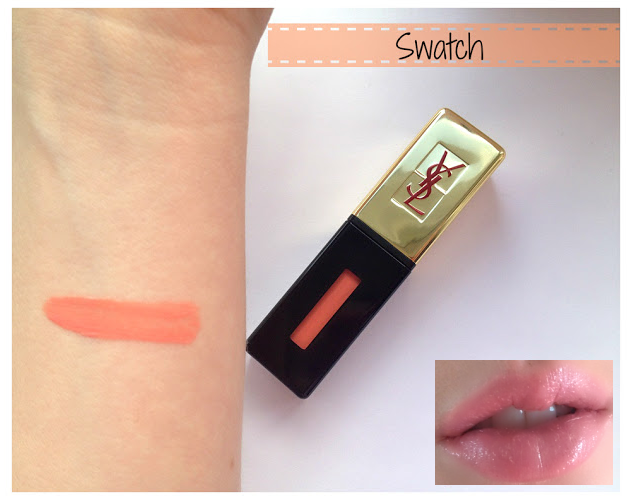 If you have lighter coloured lips then this will show up absolutely amazing on you, but if you have darker lips then this won't translate as a "light peach" but more of a Coral. My lips aren't dark but they aren't light, so what I do is apply a tiny bit of my YSL touche eclat just to lighten and create a base for my lips. I find that doing this helps me to get the best out of the product,and you can do it with any lighter concealing product, just make sure you don't put too much on your lips. If you are looking for a fun spring/summer shade but can't decide if you want a lip stain, lip gloss or a lipstick then this would be the perfect product for you. Being YSL it is expensive and retails for around £22.50, but I honestly do think that its worth it. However, there are plenty of great alternatives such as the Rimmel Apocalips and the L'Oreal Stains are an amazing dupe (as L'Oreal owns YSL). Overall, I think that this is a stunning lip product and would be a perfect purchase for the SS season. I think this is one of the prettiest shades for spring. Wow this shade looks gorgeous - I've always wanted to try out one of these! Seen lots of great reviews about this product, must say that this is the prettiest shade ive seen so far, great for summer! i'm pretty sure I have the same one, mine is #27 but i can't find the name anywhere on it! it looks identical to that though and i absolutely looove it! YSL's packaging just makes you feel so lux! The concept of being able to build up the color of a gloss is really intriguing as well.